To keep her family from scandal, Mattie Rayment needs to marry off her flirtatious younger sister before the Season ends. Vouchers for Almack's are her best hope to secure a suitable match. When the Rayments cross paths with Oliver Bolton, the nephew of their steward, his interest in the younger sister threatens all her plans. It is up to Mattie to steer Oliver away, but before long she finds herself losing her heart to him, unsuitable match or not. A lost bet. An underestimated country bumpkin. Who will win in this war of wits? Why, love, of course! Rua Postlethwaite has lived a sheltered, content life in the country until she is orphaned and forced to find work or make a hasty marriage. Her neighbors come together to try to help her have a successful Season after she receives an unexpected offer to go to London. Lord Deverell is the quintessential bored aristocrat with too much time, money, and handsomeness. When he loses a wager over a game of billiards, he finds himself doing more than dancing attendance on a nobody from Yorkshire. Felicity Bandbury has come to London with one aim in mind: give her dying sister the Season of her dreams. But it is a tall order for a young lady who knows nothing of Town or Society. She enlists the help of their neighbor and childhood friend, William Carlisle. He’s not been home in years, not since the sudden loss of his parents. Felicity’s request offers him the hope of healing from his own grief as well as a connection to home he desperately needs. Can two grieving souls find room in their hearts for love? I love the Timeless Regency Collections! Each of the stories has a common element, but they always end up so unique from each other. I love discovering new-to-me authors and always enjoy the stories from my favorites. I felt like these three had great character development and plots that were interesting. 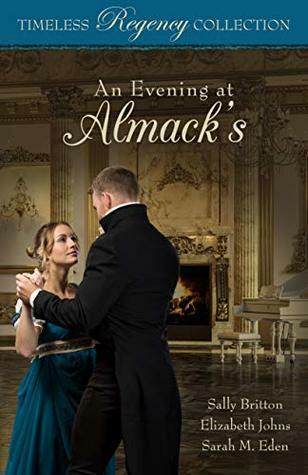 I had known about Almack's from other books I've read in the genre, but I learned some new tidbits from this one as well! It is a perfect example of the nuances of the various levels of Society, the ton, and their rules- both known and unspoken. I especially liked Sally Britton's story, with Oliver being drawn to one sister initially but after a deeper look, realizes who would make the better match. Their mutual admiration brings nice chemistry to their relationship, even while they are each working on an agenda that sometimes puts them at odds. My Unfair Lady brings elements of humor as Rua enlivens a group of friends with some borderline antics as she and her friend seek to trick the men after learning she is the subject of a wager. It is an entertaining story but the characters were a bit two-dimensional. Six Wishes by Sarah Eden brought depth with the bittersweet elements of bringing happiness to Felicity's sister and helping William overcome his long held grief for his family. The genuine friendship between Felicity and William develops into something more as they support and encourage each other through their times of emotional hardship.